While calling the remote API simxCallScriptFunction from a C++ program to create pure shapes in VREP, the object handle getting returned to the C++ program is occasionally different from the actual shape's handle. 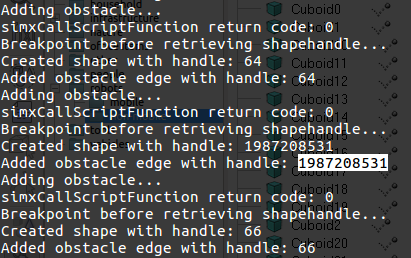 The shape handle created by the lua script in VREP was 65, but 1987208531 was returned to the C++ program. For shapes with handles 64 and 66, the handle returned to the C++ program was correct. They were called through the same C++ code in a for loop. Can someone kindly shed some light on why this is happening? Thanks. -- -- take note that lua array indexes start at 1! please try following and tell me if it works. Hi, thanks for your help. I've tried your code and the returned data was all correct.